The last day of RON95 staying at the price RM2.10 per litre. We shall not forget October 1, 2014. Just being dramatic because suddenly everyone is talking about the increasing price of fuel RON95 and Diesel. The announcement has been made by domestic trade ministry on evening today. The most obvious impact is there will be increasing traffic to the gas station later. Will it be another hoax ? Well, it not likely to be because this is more than a rumor from a friend. There was an announcement already. As if you ask whether or not it could stay RM2.30 per litre, it will be difficult to say as looking at the previous event of increasing of cigarette price but next few days there was an announcement made to make the price drop. I think the ministry trying to test the public. They want to make the public felt common about price increasing in any goods and services. So that in the future, the public is shock resistant to these kind of news. It pretty much shocking and could make anyone faint about the news increasing fuel price nationwide. It did not come as unexpected, few days earlier, some people already spreading rumor there will be increasing of fuel price. Most people would not believe him about the increasing fuel price. However, the rumor turned to be a true alarm. As I was writing, you only have 30 minutes more to fully pump fuel into your car at nearest gas station. RON95 RM2.10 per litre will be dearly missed. 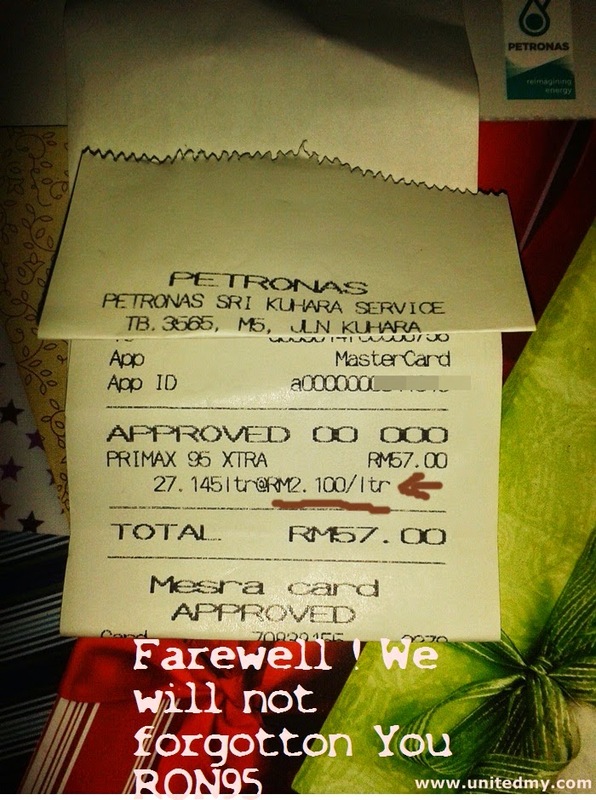 Goodbye see you next time hope to see you again in nearest future if somehow fuel price goes down magically. Tomorrow which is October 2, 2014 is effective date for RM2.30 per litre of RON95 and RM2.20 for Diesel.